On our last visit to the Park, my wife & I hiked from Tamarack Flat down to Rainbow View and back. Shortly before the road hits the beginning of it's down-slope and you first get a glimpse of the Valley (I think is the spot which is labelled "Oh My! Point" on some old maps...about 3/4 or a mile west of Rainbow View), the road widens considerably. If you've been on this section of the road, it's also noticeable for their being three obviously old trees side by side...one on either side of the road and one dead-center with enough room for stages and/or old cars to go around either side of the middle tree. In the early days of Yosemite travel, there was a small hostelry named Gentry's in this area. I also recall reading that there was a "vehicle checking station" at this point in the early days of car travel (at that point (I think in the stage days as well), travel down this stretch of the road was one-way (up on the hours, down on the half-hours (or vice-versa)...or maybe it alternated on the hours instead of the half-hours) and the checking stations helped control this). I'm sure I've got this information in old books somewhere, possibly with some period pictures but I haven't had a chance to look it up since I've gotten back home. Is there anyone here who's familiar with the section to which I'm referring and can comment on the Gentry's/Checking Station association? I'm also curious about Oh My! Point...I may have it on some old USGS maps but the only one on which I've found it since getting back is an old hand-drawn map which is quite approximate. Anybody know a definitive location for OMP? And before people ask, yes, I will post a trip report with pictures soon but I have the sort of job that when you take almost two weeks off, there's a LOT of catch-up work to do when you get back so it may take me a bit! There are many threads about the Old Big Oak Flat Road on this forum. And there are even several books that have been published about the thing. However, the original Gentry Station was a stage coach team-swapping stables dating back to when the road was first built. It may have been back up the road a short distance from the dot on the map, in order to have more space for buildings and an all-year stream to water the stock.. Perhaps closer to where the trail from El Cap came in at that time. So it depends on which Gentry Station you are talking about. There are many threads about the Old Big Oak Flat Road on this forum. Yup...I've read most of them...just hadn't seen specific reference to Gentry's in them. And there are even several books that have been published about the thing. I have the Irene D. Paden and Margaret E. Schlichtmann book and there are certain discussion (sometimes extensive) in other books (especially the Yosemite Yesterdays books and the Yosemite Grant hardcover book) but the Paden/Schlictmann's the only one I know that's exclusively about the road. Are there others you're aware of? Without pulling out my GPS and double-checking co-ordinates, that appears to be exactly the spot to which I'm referring. However, the original Gentry Station was a stage coach team-swapping stables dating back to when the road was first built. Actually, before that, it offered crude accommodations for travelers significantly before the road was built (back when you had to take a horse (or walk)) the final several miles in to the Valley. It may have been back up the road a short distance from the dot on the map, in order to have more space for buildings and an all-year stream to water the stock.. Perhaps closer to where the trail from El Cap came in at that time. I'd have to pull out some of my old maps to determine where the El Cap trail came in at that point but the spot I'm referring to was definitely big enough for the size of building we're talking about (there's a relatively large flat area to the north of the road at that point). Good point about the water, though. Still, Paden/Schlichtmann describes the original Gentry's as being "The last station on the road...down the mountain from Tamarack Flat at an elevation of 5627 feet. 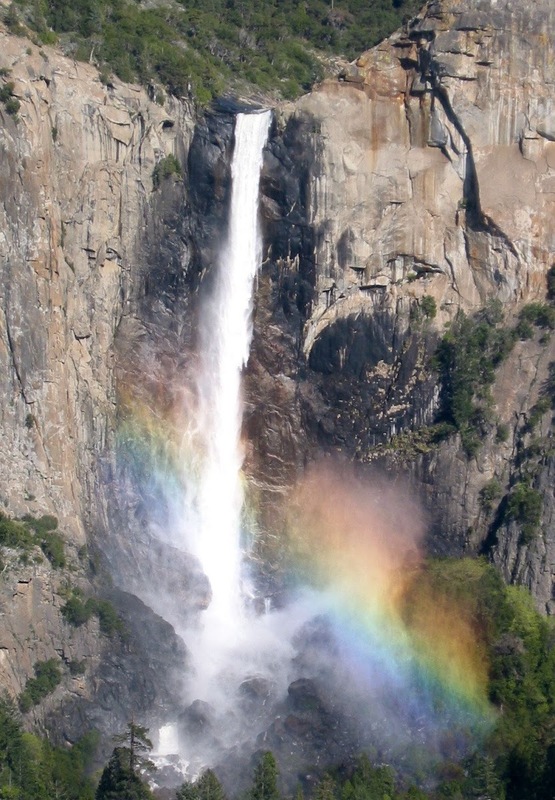 It was on the brink of the tremendous cliffs overhanging the canyon of the Merced just below Yosemite Valley but was so hemmed in by timber that the precipice was invisible." Looking back at the USGS section of map you posted above, that would seem to place it pretty darn close to the Checking Station (and, if anything, further DOWN the road rather than up the road (although, once past that point, there's no place for stages to even pass one another, much less put a building). So it depends on which Gentry Station you are talking about. Definitely referring to the early "stopping place" that dates back to the days when this section of the "road" was still just a horse trail. It is my understanding that Rainbow View is Oh My Gosh! Pt. Unfortunately I cannot at the moment find the map with OMG on it. Everyone is now calling the Lower Yose view point OMG now it seems. I know what you mean about the Lower Yose overlook. On the older maps, though, it's clearly nowhere there. Here's the map I was carrying with me on last week's hike (from the Paden/Schlichtmann book). Edited 1 time(s). Last edit at 09/15/2011 07:07PM by DavidK42. Maybe it is BM 5729 on the USGS map? Didn't go that far last February. cliff edge it still is not as nice as Rainbow View. Anyway, glad you had a great trip and were able to hike on some of the old roads. I know you have a passion for it. Any chance you went searching for the Old Yosemite Grant sign? Interesting, what do you mean by sign? Is it just the benchmark/boundary marker of the old grant or is there a sign/plaque or something of that nature there? There's a couple of signs on the trees and a boundary marker. No plaque per se. Thanks to YosemiteSteve for his NPS video of this on Maps. Cool. So the marker with the right angle bend on it would be at this spot, where the old grant line took a bend? (Give the map a minute to fill in from the web.) And the bench mark on this map at 5729 is the exact location of the old entry station? My GPS can find that place easily enough. Completely agree with that...although it is pretty dramatic when you first come out of several miles of travelling through the woods (also some particularly beautiful spots as the old road more or less parallels Cascade Creek south (and east) of the bridge. I can't recall if I've ever seen pictures of the original bridge across Cascade Creek. Pretty sure the current one post-dates usage of the road as a road (the pavement is still pretty intact on both sides but the current bridge, aside from not looking very car (or even stage)-worth, is a few feet lower than the road bed). Oh nuts! That didn't even occur to me when I was out there...I'll just have to go back, I guess! Thanks for the history lesson. According to same site/source, the OM! point was later renamed to Rainbow View. Which time of day would be best for the rainbow? Well, the original OMG Point may have been near the entry station. Think about it. People had to spend time there, messing around with the horses, and they weren't going to just sit on the stage. Also, the El Cap Trail would have routed to that point, just as the Pohono Trail was originally routed to Fort Monroe, to meet the Old Wawona Road there. It's where the rangers were. It's where you could buy some supplies from the stage crews. So the map is probably accurate in that sense. But after the automobile came and the entry station was moved, Rainbow View was definitely where it is now, at the pipe rail above the great switchback. In a book called "Tales and Trails" (paraphrasing), it says the best time to go is late afternoon during either Autumn or Spring. One can start from the base of El Cap, near the V 9 marker, off a dirt road. I'm sure this has been mentioned at some point in this thread. Foresta would be another TH. Not certain about the accuracy of this fact, but book states Rainbow View was later renamed to "New Inspiration Point." Edited 2 time(s). Last edit at 10/09/2011 07:36PM by Ohnivy-Drak. Edited 1 time(s). Last edit at 09/16/2011 02:38PM by hotrod4x5. It appears that a small portion of it, between Tamarack Creek and Cascade Creek is still in use as part of the current trail that starts near the junction of Foresta Road and the current Big Oak Flat Road. But what about the portion of the "Lower Trail" between Crane Flat and Tamarack Creek that appears to travel around the vicinity of the Devils Dance Floor? Does remnants of this part of the Lower Trail still exist today? Edited 2 time(s). Last edit at 09/15/2011 10:49PM by plawrence. OK, I've bushwhacked down that slope to that current trail numerous times, skirting either side of the cliff at the Devils Dance Floor. 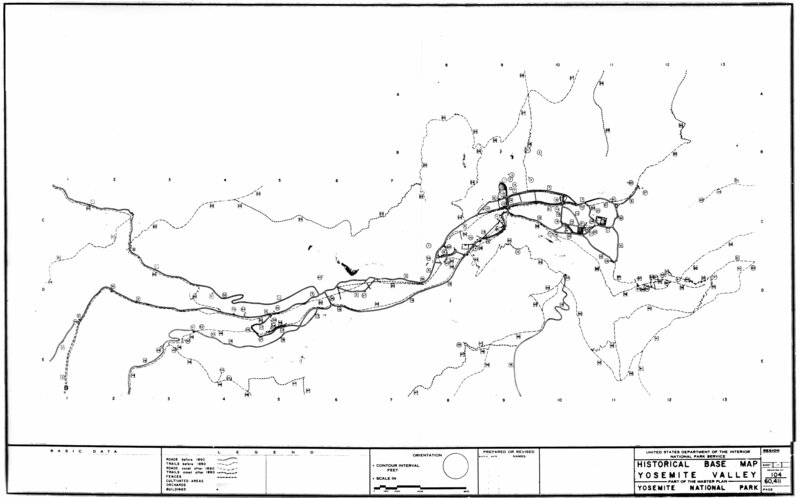 Yes, the current trail follows the eastern portion of the "Lower Trail" as shown. There probably was a trail in the general vicinity of the rest of it. But I can assure you that the western part has been completely overgrown with brush and then burned several times, and there is no visible trace of a trail to be found, except deer trails that go into thickets. OK, here is more than you wanted to know about these things. I stumbled upon my copy of "the Big Oak Flat Road to Yosemite" by Margaret Schlichtmann (1959) today. It is a marvelous book, with many fascinating photographs. Unfortunately, my copy is a wretched 1975 paperback version which really botched the photos. It starts with a photo of the dead trunk of the Big Oak at Big Oak Flat (1870), which is certainly the largest oak that I have ever seen. This book has chapter about the section of road that we are discussing, which clears up a lot of things. Especially when combined with the overlay map "Historical Base Map of Yosemite valley". I wish I had a copy of the map that this is an overlay for. On this overlay,  is the Old Big Oak Flat Road. But it didn't exist until 1872. For a decade or more before that there was a pack trail  leading from Crane Flat down to the the Valley. As the BOF was being built, people would travel the stage road to its terminus, then by horse and mule to Gentry's Hotel, (6) on the map, which grew into a major enterprise. At this point, they would transfer to the mule outfit that went down the pack trail  to the valley. Note that it descended steeply down to the valley at a point before the great switchback. Chick-On talks about having done some bushwhacking in the area recently, I think. Anyway, the mule track did not cross the huge talus piles where the Zigzag would be, which makes sense to me. (31) on this map is the pipe rail labelled on the overlay "Rainbow View or Oh My! Point". But Ms. Schlichtmann has a different story about that. See below. Of course,Oh My! Point is wherever the current stage coach driver tells you that it is. By the way, the author is very clear that the great switchback is to be called "the Zigzag". I stand corrected. "After the Zigzag became a control road the checking station was at Gentry's. There was a similar station on the valley floor. Down traffic was allowed to proceed at stated hours. Up traffic checked out of the valley in the intervals. For forty years, from 1874 to 1917, only horse-drawn vehicles traveled this stretch and two miles an hour was a fair average speed. Nor, especially on the up grade, was there much once could do about hurrying it." In the overlay map above, there is a small bridge shown near the upper left corner. This is not the bridge over the upper branch of Cascade Creek. The overlay doesn't go quite far enough to show that one. It is a bridge over the next branch, where the Lower Trail comes in from the west. Both are shown on the topo map higher in this thread. Unfortunately, Chick-On did not post the next piece of map to the northwest, which would show the following bit of interesting bushwhacking to be done between Tamarack and Cascade creeks: "A generous two-tenths of a mile past the present bridge over Tamarack Creek [traveling west from the saloon at Tamarack Flat] brings one to a well-marked gully leading up on the left. Along this small gulch went the Mono Trail joining Tamarack Flat with Yosemite Creek... ...It was exceedingly rough and steep even after being cleared out and blazed in 1857, but had the advantage of water and shade. Now it is impassable. [This was written in 1959.] Other portions of the Mono Trail have been maintained by the government for modern hikers, but this branch has been forgotten and is recognizable only by the blaze marks about six feet up on the large trees. Many of them have fallen and disintegrated but such marks as are left are always to be found on the right of the trail no matter in which direction one is traveling. [Meaning that they didn't blaze both sides of the same tree.] About a mile up the hill the trail goes through "Split Rock" which looks as if it had been divided for the purpose." Some interesting bushwhacking to be done there. Do any of the blazes still exist fifty years after the book was written? I have found some very interesting rock formations in that area, but don't recognize that one.... 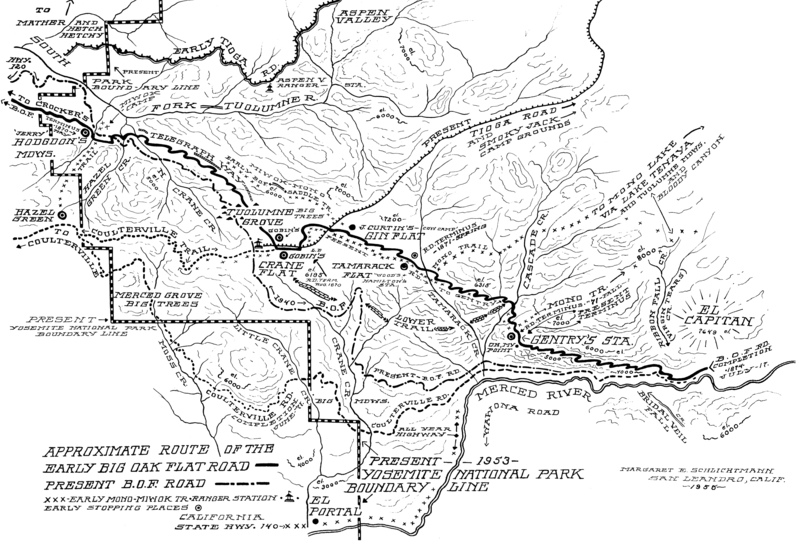 The overlay shows only the "Gentry Branch of the Mono Trail" , which is part of the El cap Trail in this area and not the neglected branch mention here. Another bit of possible bushwhacking has to do with the early bridge over Cascade Creek. It may have been below the junction of the two tributaries shown on the topo map above. "The telegraph line to Yosemite followed the road and at this point both plunged down through small, precise silvery fir trees to cross Cascade Creek. A keen observer may be lucky enough to spy one of the rare dull green insulators still fastened high on a tree." Of course, the telegraph would have been abandoned as soon as the railroad came up the Merced River to El Portal and a dirt road (140) went into the park from there. Are there any of those insulators still left? There was recently a convention of telegraph and telephone insulator collectors here in San Jose. They hunt for those things, so there may be none left. But this would involve serious bushwhacking, so maybe there are still some there. What a shame that I'm stuck back East for another month or so. Chick-On might beat me to it. And scrawny birds are better than I am for looking at things in trees. Maybe the marmots will get him first. Edited 1 time(s). Last edit at 09/29/2011 11:30AM by wherever. My profound congratulations! 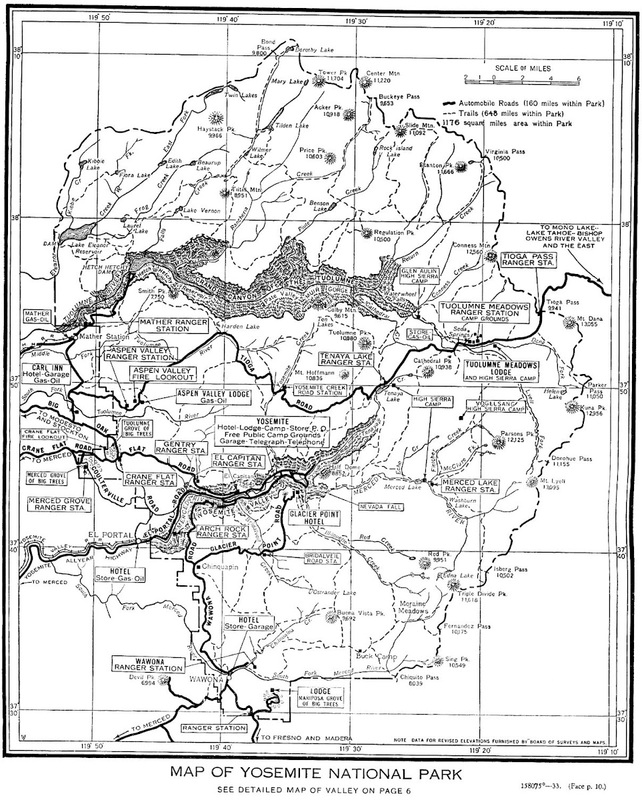 I believe you have acquired a map assembled by the late man and wife team of Yosemite historians Bill and Mary Hood. I was provided a copy of that map in the early 70's, but lost it in several moves. Can you advise if the map and guide are available to the public? I would like very much to obtain a copy. I almost forgot to mention that if you walk the Bridalveil Moraine located at the bottom of the Old Big Oak Flat Road, you can see at least one wooden insulator holder nailed to a large tree. The moraine was used as a roadway to access the El Capitan Bridge which crossed the river at that point. When I worked in NPS campground maintenance in 1969 with the late Jack Kirk, he told me that his brother - NPS welder William Kirk - first started making the trademark Yosemite bearproof signs from metal salvaged from that bridge. You have resurrected a lot of good memories with this topic! Ah. So the bridge shown on the overlay near El Capitan is not the current bridge east of the meadow, but one closer to Ribbon Creek? That makes sense, given its close proximity to the end of the old road. There are a whole lot more maps on the Chick-On Memorial Map Library link. But they are unlabeled, and it takes a while to find the one that you want. There are other map sites mentioned in other threads on this forum. There are two of these overlays. One for the whole park, and one close-up of the region near the valley. What I posted was cropped from the close-up map. I haven't found any map on the site which is at the same scale as the overlay. I got it pretty close. Edited 1 time(s). Last edit at 09/27/2011 10:33AM by chick-on. Thanks for mapping the overlay! Something very interesting that I noticed about the overlay in regards to the Old Four Mile Trail and Moran Point. It looks like an old alignment of the Four Mile Trail actually went right by Moran Point. According the overlay, going downhill from Glacier Point, it looks like the Four Mile trail via very short switchbacks went first by (or very near Moran Point) then headed west to Union Point and then went down the old alignment below Union Point (past Agassiz Column). Here's a blurry crop of your map above that shows how an old alignment of the Four Mile Trail went by (or close by) Moran Point. Note that I've seen parts (near where the switchbacks of the old trail depart the present trail) from above on the present Four Mile Trail and I've seen hints of it from Google Earth. Absolutely right. Agassiz Point and Moran Point wouldn't have been nearly so famous and well photographed if they hadn't been right on the original trail. It's interesting that whatever map this was traced from, it shows the old trail alignment in some places, but it shows the modern alignment of the bottom switchbacks of the Four Mile Trail. 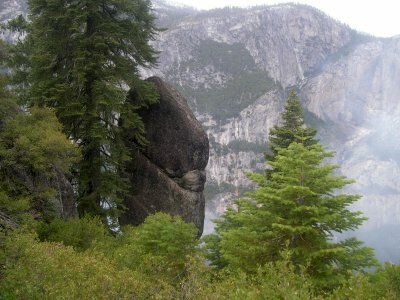 It also shows an obsolete alignment of the switchbacks at the bottom of the Yosemite Falls Trail. I forget when that work was done, but between those two facts it should be possible to get a pretty good handle on which topo map they used to make the overlay. It also shows the old alignment of the trail just above Ribbon Falls. Again, I don't remember when that stream crossing was moved upstream. But some geezers on this forum probably do. Many thanks to Chick-On for providing the overlay with a map! Hmm, interesting... I poked around the Four Mile Trail a bit recently, and I recall seeing old sections of trail crossing the current switchbacks between Union Point and the traverse to Glacier Point. There may have been an earlier alignment further to the north (as indicated on the map above), but there's also a set of abandoned switchbacks that more closely follow the modern alignment. On a separate note, I tried to follow the old alignment from below Union Point upbound, but the beginning is completely overgrown with manzanita and other stubborn, hardwood shrubbery. I gave up after going maybe 20 yards in 15 minutes. The upper portion is similarly overgrown--you can literally walk on the manzanita. Too bad--the middle portion, with elaborate rockwork--seems to be mostly clear and in decent condition. I was looking for Agassiz Column, which ends up is quite visible from the current trail and is only yards from the Union Point railing. Yup, been there, tried that. I think the radio tower installation above (southeast) of Union Point is on one of the old trail alignments. The upper portion is similarly overgrown--you can literally walk on the manzanita. Too bad--the middle portion, with elaborate rockwork--seems to be mostly clear and in decent condition. I was looking for Agassiz Column, which ends up is quite visible from the current trail and is only yards from the Union Point railing. I'm not sure if it's that close to the Union Point railing. 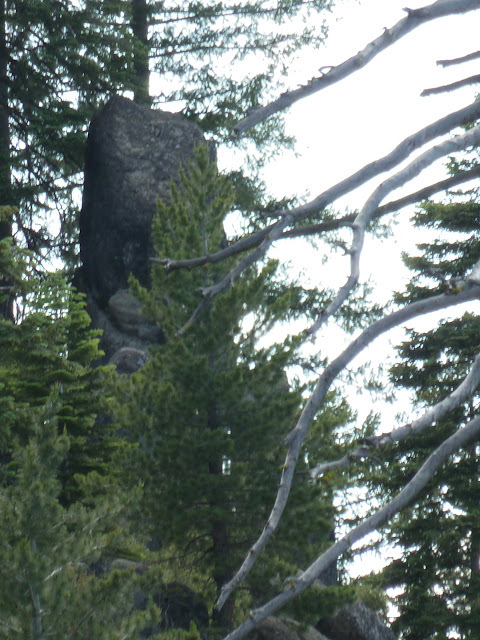 I think that's another similar rock formation but not Agassiz Column itself. Agassiz Column is a bit more further east. You can see it from trail just past Union Point looking roughly northwest through the trees, or further down past a couple of switchbacks looking up and to the west. Although it's hard to tell, in the second picture, the Union Point railing is (barely) visible between the two tall trees. 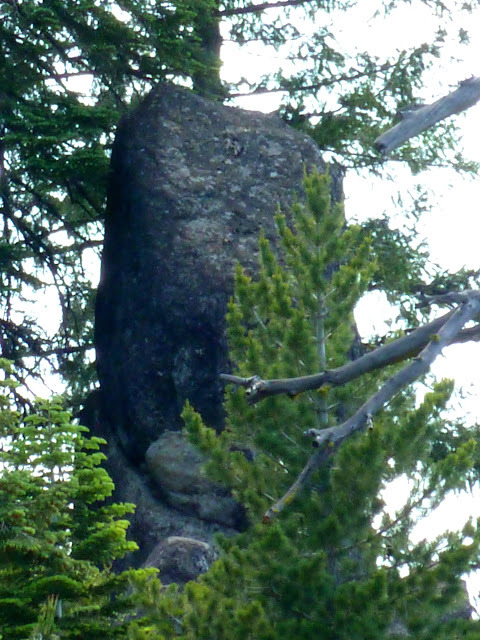 It's far from conclusive that the top two photos are Agassiz Column, but the location of the nearby large trees and general shape of the rock are consistent. Anyone know what this thing, just above Union Point, is? Presumably some communication facility? There doesn't seem to be power or cabling going to it, unless it's buried along the old water works path. The other reason why I don't think the rock right next to Union Point is Agassiz Column is that the person who took the above photo in 2007 would probably had pointed that out. By the description of his account how to get to the rock, it's a bit father away from Union Point than the rock that's right next to Union Point. I wondered about that too. I think though that this possible radio tower could be actually installed adjacent to the old alignment of the Four Mile Trail that went past Moran Point. Just a hunch on my part. Edited 1 time(s). Last edit at 09/29/2011 09:29PM by plawrence. That's a passive microwave reflector, also known as a mirror. You aim a microwave beam at it, and angle it so that the beam bounces back to your receiver somewhere else. It doesn't take any power. It's just a sheet of metal. They are common at ski resorts. Of course, both transmitter and receiver have to be able to see the front of the mirror. The one thing that makes me wonder if this rock, that is so close to Union Point, is actually Agassiz Column is why all the beta I've read on how to reach it, like from the person who took that 2007 photo of it, involves much more hiking than just going to Union Point and hiking around railing, which looks possible from the westside of Union Point (though there is definitely some exposure involved because you would be climbing around the Union Point rock wall). Approaching that rock from the eastside of Union Point would be nearly impossible now (even though that's how the old Four Mile Trail alignment reached Union Point from the valley) because that area of Union Point is just too overgrown with manzanita. Here's how to get there. Its above the current Four Mile Trail (and just below the old Four Mile Trail, which was rerouted in the 1930s, I believe). I hiked up from the Valley Floor, but it's much easier to hike down from the top and back. At the point in the trail near the top where the trail switches from the west-facing switchbacks to the east-facing shaded part of the upper Four Mile trail is a viewpoint, not signed, but I think is near the old Union Point. About 100 feet up the viewpoint is a metal gate. Another 100 feet or so up is a sandy, east-facing slope above the Four Mile trail (on the right, heading up the trail). Carefully climb up the slope, taking responsibility for your own safety. About 20-30 feet up is the old Four Mile Trail. Stay on the old trail, which switchbacks up to the top of a ridge after 200 feet or so. The trail is covered with several inches of pine cones and needles, but is clearly visible and is free of brush on this segment of the trail. At the top of the ridge, on your right as you head up (north) is the top of a rock wall and Agassiz Column. It's surrounded by Manzanita brush and a few fir trees. At the top of the ridge, on your right as you head up (north) is the top of a rock wall and Agassiz Column.. 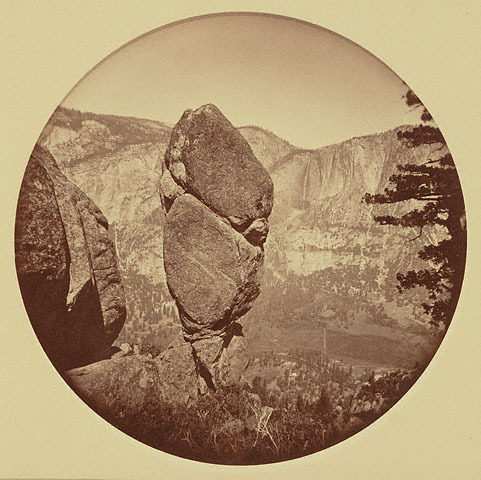 Here's an old stereoscopic photograph that matches Dan's description of going up the old Four Mile Trail and viewing Agassiz Column on the right of the trail. On the lower lefthand corner of this photograph you'll noticed the old Four Mile Trail turning a tight corner of a switchback with Agassiz Column on the righthand side of the trail (before switchback turn). All the photos shown are Agassiz Column. Every single one. Spot on. Fairly trivial to get to imo. Kewl, thanks for the postcard! Good sleuthing! Unfortunately, I have to help launch a new website, so not much exploring for awhile :-(. Where did you pick up the old 4 Mile Trail heading down? My guess was that it should start almost at the Union Point railings heading north, but I didn't see anything definitive through all the manzanita. Basil, You are welcome. I was thinking it took you a bit of time to even find the beginning of the trail at the bottom. fix it up some... most of the trail is in incredible shape and has some very cool switchbacks and rock work. To get to it from Union Pt... just zig almost due east from the big open area (old comfort station location). new trail near where they close the trail. As for the Column itself... the pictures don't due it much justice. It's pretty darn kewl. on the north side of it. Since you can see the trail below... the converse is true. I can spoil it and show more pix if you like... or you can go check it out fur yurself. Enjoy. Could the mystery sign be the (former) junction with the spur that went directly from the 4MT to Sentinel Dome? Then what, may I ask? And if I'm not mistaken (but I could be) there's a pretty obvious short use trail (or maybe part of the old trail) from this point that meets up with the new Four Mile Trail maybe about 40 to 70 feet just east of the current Four Mile Trail - Union Point spur trail junction. on the north side of it. That's what I figured as an alternative route to get to that rock in your photo. I just didn't realize that rock was actually Agassiz Column from looking at it from Union Point. Thanks a bunch for clarifying this. By-the-way, in your explorations of the Four Mile Trail area this weekend, did you spot any signs of the old alignment of the Four Mile Trail that went past Moran Point as shown on this crop of your map overlay? You can see the Agassiz trail on the USGS Yosemite Valley map linked to below on this site. main trail is there... and it's mostly NOT manzanita... so it's easy to bust through. At least that is more or less my recollection. The USGS Yose Valley map also shows where the "mystery" sign is located. After reading your post, I think my problem was that I didn't head far enough east from the former comfort station location before I started to look for the way down towards Agassiz Column. Next time, I'll travel a bit more east through the shrubbery to find where the old trail turns north. Again, thanks for the info. Much appreciated. Edited 1 time(s). Last edit at 10/09/2011 10:49PM by plawrence. Now I'm a little confused. Did you get on the old trail? the rock in the photo with the railing in it... Union Pt. Prolly too much info. But I like this stuff so you should too. I'm not sure. Personally, I don't think I did. But I did do what you stated before, "To get to it from Union Pt... just zig almost due east from the big open area (old comfort station location)". That's exactly what I did. But after doing that, I couldn't find a doable way to go further down (and north) to where I saw the old trail below Union Point. So I think I might not have gone as far east as you did from the old comfort station site. could maybe rap down though (the seed is now planted in my noggin). Oh, I love this stuff too. Definitely NOT too much information. Keep it coming! There is absolutely NO mistaking if you are on the trail or not. There are about 6 switchbacks with LOTS of rockwork. and was amazed at how free and clear the trail of switchbacks you almost immediately see after that pt. was. Should just meet you at GP sometime and can take you thru it... and also check out Moran pt. V. interested in that again now. The overlay map sure makes it look like there should be lots o switchers above Moran east of current trail. I'm aware of the part of the trail which I was definitely NOT on. My question is how you got to that part of the trail from Union Point? When I was there in June, I didn't see any direct way except for wading through some extremely thick growth of manzanita. I've seen the switchbacks free and clear east of Agassiz, but not between Agassiz and the junction with the current Union Point spur trail. That's been my problem. I think I've seen glimpses of part of that old trail from the transverse of the current Four Mile Trail. When I have time, I'll post one of the photos I have that I think shows part of that trail. I've also seen what could be some of those switchbacks on Google Maps and Google Earth satellite photos of the area. Edited 1 time(s). Last edit at 10/10/2011 09:47PM by plawrence. Again, it was a quick zig from comfort station heading almost due east. it doesn't try kicking you in the groin as you go by like Manz does. Sorry I didn't take a photo from the rock to the east of the railing. This really needs to be spun off. Since we are no longer talking about the OBOF road, or even anywhere near close! My Moto is... if I didn't have to back thru it or crawl for a long way... then it must not have been that bad. But, I know the feeling of getting straps stuck on shrub. Argh! Old apian saying: At all costs avoid following poultry into manzanita! On a somewhat related note... there is another "mystery" sign between GP and the junction up to Sentinel Dome. Edited 1 time(s). Last edit at 10/09/2011 07:37PM by plawrence. At this point, they would transfer to the mule outfit that went down the pack trail  to the valley. Note that it descended steeply down to the valley at a point before the great switchback. Chick-On talks about having done some bushwhacking in the area recently, I think. I was further west. Directly above the easternmost tunnel on BOFR. Looks like the old pack trail is east of Fireplace Crk. Going down where I did is worthwhile... very nice and fairly simple. Still haven't found a definitive explanation of this but, just browsing through some Google results, it appears that Oh My Point and Oh My Gosh Point are two different locations. Going through several pages of search results, all OMP references seem to be on the OBOFR (aka, Rainbow View) whereas all refs to OMGP are to the Lower Yose Falls overlook. The hand-drawn map I posted above is certainly too crude to rely on but it certainly does seem to show OMP as being a mile or so west of Rainbow View. It certainly seems like there SHOULD be a name to the point when you make a sharp right coming out of the changing station and suddenly see the Merced River a couple of thousand feet below. As I said before, clearly not as nice a view as RV but still seems to be deserving of A name. Of course, if every beautiful view in Yosemite had a name, the list of names would be bigger than the San Francisco phone book! Has anyone seen any remnants of the old Gentry Station? I believe I read the report, but missed his photo set. Anything left of the Gentry Station though? The foundation, stilts, other pieces of the building, etc?